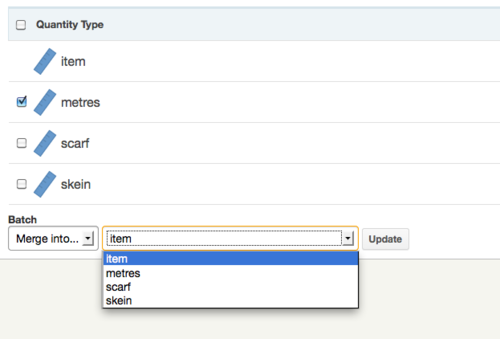 You can now merge out and delete your unwanted quantity types using the Batch merge tool on your Quantity Types page. Firstly select the quantity types you wish to remove using the checkboxes next to each quantity type, then select the “Merge into…” option from the Batch tools option in the left bottom corner of the page. Next, select the quantity type you wish to merge these into (this will be the one you want to keep). Click the “Update” button and the merge will be performed. Please Note: The “item” default entry unfortunately cannot be deleted or merged out.